February can be one of the coldest months of the year but one of the best parts of the gardening year. It conjures thoughts of cold, wet, grey wintry days however the emerging spring bulbs provide a glimpse of the colour with a hint of what’s to come in the following year. If you know Daphne odora Aureomarginata, you'll probably get a bit twitchy in January and February, as these plants stay stubbornly poised to bloom, just waiting for the weather to break a little. When the buds do burst you smell it before you notice it. Daphne is one of the most fragrant plants in the garden at this time of the year. Winter daphne is native to China and has been described in that culture’s literature for a thousand years. The plant was named by Thunberg who first saw it in 18th century Japan and described it in his work, Flora Japonica. The plant was first introduced into Britain via Kew in 1771. Daphne odora marginata is a hardy compact evergreen shrub notoriously difficult to propagate which does make new plants expensive. However, they are well worth every penny. The handsome foliage is narrowly and irregularly edged in gold variegation, making it a good backdrop shrub when out of flower. It is a slow mover and, like all slow movers, resents disturbance. So, think carefully before you plant as there is no moving it once its established. To appreciate the intoxicating scent in the garden Daphne is best planted towards the front of a sunny, sheltered border close to an entrance or path, maybe in a bed or border near to the front or back door of the house. 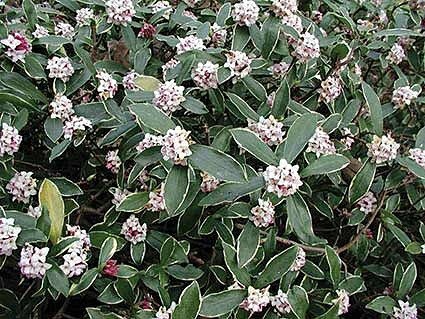 Daphnes are slightly tender evergreens, surviving best in the south and west of Britain. Soil pH is not important, but all Daphnes dislike heavy clay and winter waterlogging and prefer soil that is free-draining and rich in humus. A leafy annual mulch is beneficial. Its not greatly suited to containers, it will do fine in light shade and grows well in a woodland garden. It is also not suitable for a crowded, mixed border where they can get pushed about by tougher more competitive plants. I favour planting daphnes as part of an area of mixed scented evergreens in a woodland garden, perhaps with companions like skimmia and sarcococca. This will provide a succession of pleasures to the nose for most of the winter. Its not just a plant for big gardens it works so well in smaller plots too. I have seen Daphne odora 'Aureomarginata' romping away in tiny front gardens flowering its socks off. This can only be a delight for all passers-by who catch its sweet fragrance. • In late February cut back hard (coppice) all the Cornus (Dogwood) to low buds. • If snow falls – do not let the snow sit on the shrubs, gently shake off to prevent damage. • Prune Roses creating an open outward facing framework. • Shape borders to neaten edges. • Remove weeds from borders as necessary. • Prune out dead; diseased or damaged wood from trees and shrubs. • Complete pruning of Apple/ fruit trees if not already done. • Mulch borders if not already done in Autumn – taking care of emerging bulbs. • Cut back Hydrangea Preziosa to first healthy buds on stems. • Cut back Hydrangea Annabelle to a half/third to retain a compact shape. • Cut back side shoots of wisteria, pruning to two to three buds. • Prune summer flowering deciduous shrubs that flower on the current years growth – eg Buddleja, lavatera etc. • Sow hardy annuals for summer colour. • Buy seed potatoes and chit tubers by placing them eye end up in trays or egg boxes in a light, cool, frost free place. • Sow crops like broad beans, lettuce etc and place in greenhouses or coldframes for an earlier harvest. • Now’s the time if you want to think about planting asparagus – keep weed free and mulch with a thick layer of organic matter. • Apply general fertiliser like growmore / blood fish and bone to beds. • Mulch tree and cane fruit after pruning. • Spray dormant fruit bushes with a plant oil based winter wash to kill overwintering eggs or aphid pests.